Summer holiday time is fine when the weather is good and we’re all outdoors with sun hats and shorts. But, when the wind changes, the showers arrive and a general air of grumpiness pervades a never-quite-big-enough cottage, it’s time to get cooking. I’ve been re-reading Jane Brocket’s Cherry Cake and Ginger Beer for inspiration. It’s a treasury of nostalgia, packed with a rainy summer’s worth of recipes from all your favourite children’s books: Swallows and Amazons’ Bunloaf, kaffee und kuchen from the Chalet School series, What Katy Did’s molasses paradise pies. I discovered it in a NZ library when Little Missy was a baby and the first thing I did when I returned home was get my very own copy, in readiness for the day that she would be old enough to read Milly-Molly-Mandy and Anne of Green Gables and The Story of the Treasure Seekers. Until then it lets me indulge in happy reminders of my own childhood book-wormery and I would definitely recommend it to anyone who, like me, grew up with Enid Blyton, E Nesbit, Mary Norton and other bookish treasures of a 20th century childhood. We’ve just started on ‘real’ books, Little Missy and I, with Roald Dahl’s Fantastic Mr Fox and it’s luscious descriptions of Boggis’ plump hens, the finest and fattest ducks and geese from ” pot-bellied dwarf” Bunce and – very appropriate for our house – Bean’s Secret Cider Cellar. But, before we make the step into the world of books driven more by text than pictures, I have to give a shout out to these sources of cooking inspiration on many a damp and dreary afternoon. Did you ever hear of Mickey, how he heard a racket in the night and shouted ‘Quiet down there!’ and fell through the dark, out of his clothes, past the moon and his Mama and Papa sleeping tight, into the light of the night kitchen? If you haven’t you certainly should. There’s a gorgeous read-aloud rhythm to this (once you get over the name of the naked child!) and bread dough is the best baking plaything that you could imagine. It beats marla, plasticine or playdough hands down for playability and – best of all – it can be made into something edible, no matter how beaten up. Just give it a little while longer on its last rise, it probably didn’t expect such a knocking back as it gets when small people try to fashion it into a plane, Mickey-style, kneading and punching and pounding and pulling. Just make sure your kids don’t expect to get too nudey-rudey. Recipe: set a piece of dough aside from anything in Valerie O’Connor’s book Bread on the Table and let kids have fun. It can be turned into a pizza, mini-loaf and any exceptionally well-kneaded dough can be improved with a dab of chocolate spread before baking. The indefatigable Alfie, along with his little sister Annie Rose, gets up to all kinds of imaginative things, lots of them involving food. Whether being a summertime explorer wading in streams with a packed picnic or making pastry stars with his Grandma in wintertime, Alfie is a brilliant source of ideas for occupying small people. 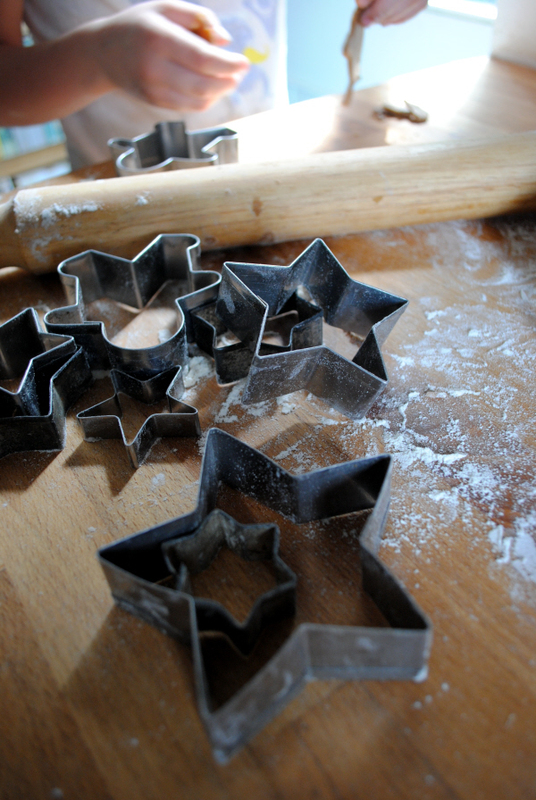 Recipe: Turn these Ard Bia Cookies into stars by rolling out the dough and digging out your own treasure trove of cookie cutters. It’s my birthday and I’m going to make a cake. Why would anyone need a cake recipe? Helen Oxenbury’s blue dungaree-clad hero(ine) goes off to collect all the ingredients, letting no one in any doubt that eggs, flour, butter (but of course! ), milk, ‘a pinch of salt’ sugar and ‘some cherries for the top’ are all you need. Well, that and a selection of animal friends to help you gather everything, make and – the best bit – eat the cake. Recipe: Best birthday cake ever in our household is this easy-as Chocolate Sheet Cake, which makes enough for one creché cake and one home cake. Just add lots of colourful decorations. While it is to be devoutly hoped that the summer doesn’t deteriorate into soup weather, it’s always wise to have something up your sleeve for such eventualities. This evocative tale of the uproar caused when someone decides to change their role – that darned littlest Duck – has also encouraged us outdoors, planting seeds and looking after the plants for our very own ‘pumpkins in the garden’. Recipe: This sweetly (Spiced) Pumpkin Soup amps up the flavour without making it too hot for smallies. If you have a cleaver, use it to chop up the pumpkin for maximum storybook kudos. A last minute charity shop stop before we went to NZ last year turned up this slim 1970s book which became one of the last things to be thrown into the bag for our trip. There’s not much of a story but I was charmed with all the detail of dressed up animals in the pictures and figured that there was more than enough to keep small eyes occupied for a while. I didn’t realise that one particular picture had played a part in the Husband’s mother’s childhood – her grandparents had a print of the Teddy Bear Camp on the wall of their house – and she had never known who the artist was. This image has served as inspiration for the not-so-rainy days; build a proper campfire in the back garden and use it to cook toast (if you can find a toasting fork!) and parboiled sausages on sticks, bake potatoes in the ashes and heat up some baked beans in the tiniest saucepan you can find. Complete the scene with colorful enamel mugs or bowls, a plateful of scones, nuts and a Brown Betty’s teapot worth of tea. Anthropomorphised animals optional. Recipe: make these (Home)Baked Beans in advance and warm them up over the fire. They always taste SO much better with a few flecks of ash, random grass stalks and a few burnt bits at the bottom. Any favourites that you’d like to add? I’m still looking for inspiration for Small Girl reading! Roald Dahl was one of my first literary loves growing up and one day my Dad brought home a copy of Roald Dahl’s Revolting Recipes. It was a simple cook book aimed at kids with recipes about how to make a load of the crazy stuff from the books. My personal favourites were the Enormous Crocodile Sandwich and the Blackbird Pie from The Twits. I wish I still had it but it has vanished somewhere down through the years. I definitely recommend it if they are into his books. I know I loved it. That’s a brilliant idea, Mark! I love how Roald Dahl puts food full and centre in so many of his books. Little Missy is just getting into them so that book will be a runner for her next birthday. Incidentally, what went into the Blackbird Pie? Just finished our copy of The Twits – I’m not sure she was totally impressed with the threat of small boy pie! I’m looking for a book I had which incorporated in it a chocolate cake recipe. You could read the book to follow the recipe or it was given at the end. I believe it was in verse? A flour less cake? Any idea what the story was about, Cris? Or the author?